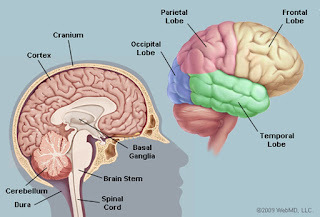 I've blogged many times about the human brain, taking time to discuss the various brain regions and what behaviors and processes they control. Your brain is an amazing demonstration of evolution in action, even in terms of its structure. The lowest parts of the brain (the hindbrain - the cerebellum, pons, and medulla oblongata) control the basics of life: breathing, heartbeat, sleep, swallowing, bladder control, movement, etc. The midbrain/forebrain* controls processes that rank a little higher on the continuum, but still not what we'd consider high-level processing: emotion, sleep-wake cycle and arousal, temperature regulation, and the transfer of short-term to long-term memory (the very basics of learning), among other things. Finally, the cerebral cortex, the outer-most part of the brain that developed last evolutionarily speaking; it is responsible for what we call consciousness, and this part of the brain in particular is responsible for many of the traits that differentiate humans from other animals - memory, attention, language, and perception. Other animals have a cerebral cortex as well but not nearly as developed as our own. This structure is a departure from the Big Five personality traits. Obviously, it includes those 5 (Extroversion, Neuroticism, Conscientiousness, Openness to Experience, and Agreeableness), but adds 3 more (Impulsivity, Imagination, and Honesty-Humility). As I've mentioned before, I'm a big fan of the Big Five (more on that here), so I find this new structure interesting but a little strange. Probably what is strangest to me is that 3 of the Big Five are considered bottom-up processes, rather than the more thoughtful, controlled top-down. I would have thought Agreeableness and Openness to Experience were the result of higher-level processing. It's a somewhat artificial divide of course. Except in the case of injury to a higher-level part of the brain, even bottom-up processes are going to be shaped by higher-level thinking. Your degree of Introversion/Extroversion, for instance, may influence your most basic response to social stimuli, but it's going to take higher-level processing to understand how best to handle that reaction and also determine what you need in that situation (that is, I'm feeling X, so do I need alone time or time with others?). What do you think about this new taxonomy? *These two areas tend to be differentiated from each other, but I was always taught about them in combination, under the title "midbrain." The forebrain includes structures like the amygdala, hippocampus, and so on. They rank higher up than the hindbrain, but are still considered "subcortical."